School kids wreak havoc in SA – Prediction for America – Dr. Turi M.D.U.S. “For those who know me and the Cosmic Code jurisdictions, no explanation is necessary; For those who do not, none will ever suffice… If every 8 year old in the world is taught Astropsychology and meditation, we will eliminate ignorance and violence from the world within one generation.” Read the future – Watch the future! What you are witnessing in the deplorable article in South Africa (below) is what is to come to the US if the scientific (atheists) and the religious (Christians etc.) traditional educational matrixes keep rejecting the vital option I am offering all children of the world to regenerate “cosmically” and spiritually. The US Department of Education is totally oblivious of the importance of allowing children to learn about their UCI or karmic cosmic identity, this “mishap” is producing all the future monsters totally destitute of cosmic consciousness acting out their stars subconsciously, neurotically like dangerous walking robots! 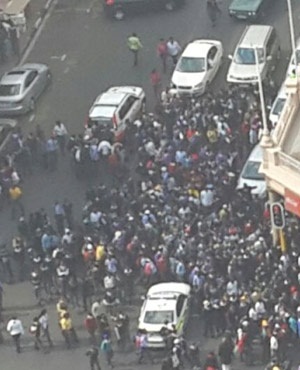 The same robots Joburg school kids wreaking havoc in CBD today! Its happening in the US too! Parents and teachers alike must soon come together and help me bring back the “cosmic” spirit of God while those children are reachable and salvageable, and this can only happen just before, during and shortly after puberty! Unless humanity begin its “cosmic ascension” immediately, those children will produce irrecoverable children of their own or the “MONSTERS OF THE FUTURE” I foresee aiming for total self destruction. Like their peers, teachers and government, they do not know about the rebirth of the “Spirit of Hitler” and the cosmic code jurisdictions and they know NOTHING of this aggressive violent cosmic flux. The scientific and medical community are far from understanding the deep psychical reasons haunting lost souls like Adam Lanza (posted 12/17/2012)! I am desperate to realize my dogs You Tube video is getting much more attention than my desperate message involving today’s incomplete “spiritual/cosmic” educational system and raise the viewers to a higher level of perception. Can you imagine Dr. Turi offering the undiluted truth to the masses on CNN or explaining “The Soul of the Cosmos” with Neil Degrasse Tyson on National Geographic? But we can all together stop those evil greedy corporate matrixes unwilling to comprehend and fix a deadly phenomena that keep bringing them the billions of medications they are after! They do not care about you, the reality of a cosmic God speaking to his children from the heavens, they need your money to build more Vatican (s) branches / churches / synagogues / temples acting as banks). 875 different religious pipes coming from the same stinking sewer… Its time to use critical thinking and behave like a smarter human being! They monopolize all teachings asking you to pray and fear a worthless, false God that bring nothing but Neptunian deception to humanity. Every single day those abusive matrixes are spending millions on all major news media asking for donations for poor kids in Africa and abandoned pets. DO you really want to help the kids of Africa? Start by helping me build a “cosmic” school there! Those fortunes are then re-invested in the “Christian and scientific machines” to build more Colleges and Universities, more religious buildings where the essence of a true cosmic God will never be approached and even discouraged and taught as the work of evil! Donations for Cosmic Code Radio and my mission for the children of the world! Now read carefully what is in store for America if humanity still exist 50 years from today! Sapa reported that the group was in Albertina Sisulu and Eloff streets around 14:00, and majority were standing in front of the education department building. Metro police spokesperson Wayne Minnaar said there had been reports of the group misbehaving by picking up hawkers’ stands and throwing them on the ground. “I came across the school kids on Claim Street in Joubert Park, looting an alcohol truck while offloading and running away with multiple cases of alcohol some were even drinking,” wrote Khongoteri Michael Nkondo. “A restaurant was almost looted as the pupils sang ‘we are hungry’. We spoke with one pupil he informed me that the police forums around the CBD are harassing them making them to learn in fear,” said Gillen Tshabangu. “They were a lot of school kids around Johannesburg CDB throwing fruits which they loot from vendors. They forced many shops to close for some few minutes because the owners were scared to lose their stuff. I’ve haven’t seen any injuries I only saw an Indian man hit with an orange on the knee. This happened between Commissinor and Delvers streets but we don’t know where they were coming from and the reason why,” wrote Ronald Frank. People in the CBD have tweeted that the children are armed and threatening vendors and shop owners. I keep warning my reading audience of the vision I have about “The Monsters of the Future” in the US and it seem my predictions always unfold! Posted January 9, 2014 – Sharing a Cosmic Code article! I WISH I WAS YOUNG AGAIN! So dad how do you like your new Ipad? Wells said one of the adults mentions a local street gang in the video. “That is why when we talk about the culture, the criminal culture, that this is to try to break the cycle and deal with the culture of violence and the culture of gang activity,” he said. This video is sickening and represents the first teachers of countless of karmic souls born with the wrong parents at the wrong places… Early in life the soul reincarnate into a negative environment forcing him to work harder at decisions making that could lead him into a life of suffering, pain and endless financial challenges. But the parents themselves are also the victims of a system that lead them to join gangs to survive because the help and education needed to become good citizens were never available. In fact while my parents disciplined me really hard I was abused by many of teachers at the public school I attended until they “fired” me at the age of 13. Many children have an impeccable, smart, curious, adventurous wise UCI and regardless of what is thrown at them while growing up, they know right from wrong and usually succeed in life… If you read my book “Beyond The Secret” my own incredible life’s experiences speaks of the drama I had to endure but never infringed the law. If the parents are themselves non educated, its only common sense to assume their children will end up in gangs. And while a large majority of kids will lead a life of crimes, gangs offer the support and security they never experienced at home. Meantime the natal UCI dictate an inborn intelligence that often surpasses the parents, peers and in my case, all the teachers who abused me both physically and mentally. As always education, environment and experiences become the keys factor to stimulate a child’ UCI in certain directions. The religious matrix does only offer to souls born with a Neptunian chart or a very heavy watery chart. Because each and every human being on earth is UNIQUE, they can only respond to what type of education they “subscribe” to naturally. The utmost error made by the religious or scientific matrixes is to assume all children were born the same, and this is why moronic celebrities chose sports as a career to express their inner drive for financial security and power. When the “teachers of teachers” will finally be allowed to teach the cosmic code in all colleges and universities they will be able to perceive and teach the children the cosmic potential their inherited karmically. Instead of questioning their very young immature selves, cosmic conscious teachers, using Astropsychology, the signs, dragons etc., will counsel and lead them right away to a life that agrees with God’s celestial will. Again there are no school that will ever produce an Einstein, a Mike Tyson, an artist, a writer, a photographer or anything else a child wants to become. Its all written in the stars for all God’s children to uncover and use appropriately. Sad enough both the religious and scientific matrixes have lost the spirit because the builders of those establishments own themselves an extraordinary rational, logical UCI where the spirit has no voice nor reasons for investigations. “The proposed initiative will take marijuana sales out of the underground market and put them in legitimate, taxpaying businesses,” said Tim Hinterberger, one of the initiative’s sponsors. “Replacing marijuana prohibition with a system of taxation and sensible regulation will bolster Alaska’s economy by creating jobs and generating revenue for the state.” But marijuana legalization opponents say there are serious health consequences, and argue the drug is often a gateway to harmful, addictive substances. Federal marijuana bill nonsense! If its stinks its bad! The fact is; money greed power and control over society becomes the fuel to legalize weed. Trusting those famous doctor and the news-media is part of a psychical indoctrination to numb what is becoming an uncontrollable society. The last thing teens need is to abuse any form of legal or illegal drugs because again the cosmic unconscious medical matrix thinks every human being will react the same way with pot. A heavy Neptunian born kid own an super addictive personality and, in time will DEMAND more powerful drugs. Guns, weed and gangs will be fed by an unstoppable evil that will breed more monsters as the years passes. Once a law is passed it is practically impossible to reverse it and I worry sick of the results in 2017 when the nasty Dragon’s Tail will enter the poisonousness of the sign of Pisces. What about 10 suicide a day a few years from now? Cops: Mom kills self, two teenage kids – Why are lawyers killing themselves? Then the government will realize its mistake and try to revert their decisions. The fact is those kids are bombarded with “legal” drugs and using weed will aggravate the situation producing an explosion of suicides. Without any spiritual regeneration humanity could also be brought back 2000 years ago with another world wide religious war. It seems like everyday I’m hearing and finding more and more of these disturbing and awful and yet unexplainable to the majority of folks the crimes that are being committed against our beloved children. As a parent of two children I pray everyday for their own safety and safety of others alike. These crimes are senseless, selfish and cowardly acts committed by love one’s, the very individual(s) you would never expect in a million years would ever be harming/killing these children. What has this WORLD come TOO??? Dr. T, all I’ve to say is your predictions and timing my friend could not have been more accurate. I’m so grateful and blessed to have your wisdom and knowledge that you dispense everyday with all of your VIP’s. I feel truely blessed to have an advantage and knowledge knowing the cosmic code. I wish that more of your 7000 advid followers would heed your callings to join our group because I know future events are clearly on a slippery slope and with timing right now not in our collective favor to rid the world of all the EVIL. Pisces Tail will bring all religions to the fore and with it wars where all means (nukes) could be used… The world will be in a “nirvanas zone” and a full restructure of religions and the abusive pharmaceutical corporations will be imposed by God himself. This mean humanity will slowly realize that drugs and religions do more damage than good, especially to the uneducated, vulnerable younger generation. And everyone will be invited to fight in the dance of evil… When I tell you we have only 50 years to turn everything around many of you will agree with me in less than 5 years from today. And this is why you need to become an active participant and help me to reach the media while I can provide a solution to a scientific/religious world gone mad. A stubborn uncompromising non spiritual science and fanatical religions are the growing cancer of the world and if you could see the horror I see so clearly, may be you would understand why Terania and I will never bring a child to this world. Meantime you have children and grand children too and I’d rather concentrate and dedicate myself to work for the psychical welfare of all future children of the world. Now keeping those crucial information for your own consumption is doing NO good to humanity at large. But I can not feed an unrewarding non curious public any-more remember? Thus post my work for me everywhere, you have my permission, then suggest everyone to join the Cosmic Code by giving them this link http://www.cosmiccode.drturi.com/?xgi=2mMSUbZ5D4D5Fe. In order for me to serve you even better and teach you more I need to spend the time for YOU and not the public. Thus you are now my only very precious connection to the public and if you trust me, (I know you do) YOU MUST make a commitment to post those articles YOURSELF and tell all the people why they should join you in the cosmic code website. I am doing this for the money VIP’s, remember I will be retiring next year and if I do not get the help I really need I may be forced to shut down the Cosmic Code website because I do not get your support. I need to reach the media and you MUST help me because this is very serious and much bigger than us all, right here right now! It sadden me to know I reach over 7000 people and only a fraction of you are VIP’s! What is the point for me to continue if you do not understand how critical the situation is? WE NEED THOUSANDS MORE VIPS’ YESTERDAY FOR ME TO MAKE AN IMPACT! You are now part of my fate and you can only be passive or build great karma helping me to help the children of the future. You may edit part of the article yourself if you feel you have to do so as to reach the very people you talk or write to everyday. In fact I truly need to know who are my TOP VIP promoters and reward those who are the most active. Thus tell people that if they join, to mention your name and get a 50% discount. Tell them why they should join and when they do, I will make a note of your name and offer you a FREE VIP Skype or Full Life reading. The moon is full and in Cancer, this is a perfect time to launch this idea, but I will not involve anyone else than my trusting VIP’s. And only my VIP’s are reading this article… Its now up to you because I will do all in my power to succeed in my mission and YOU can help me doing so! Previous post: Boy gets trapped in hot car, dies? What’s Going On? Next post: A Virginia U.S. Navy veteran ended his life in front of a Veterans Administration clinic – SHAME!